The New NY Bridge project is excited to announce the hatching of two young peregrine falcons high above the Hudson River. The project team is inviting the public to help name the newest residents of the Tappan Zee Bridge. 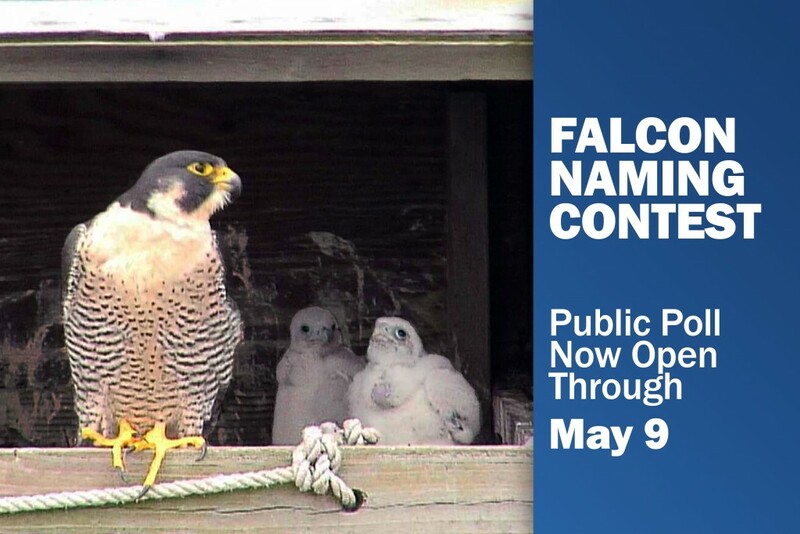 A week-long contest is now underway on the project’s FalconCam webpage. Elementary and middle school students submitted names throughout April. The New NY Bridge project team will announce the top vote-getters on May 16. Thousands voted for their favorite falcon names during the project’s previous naming contests, selecting winners such as Irvwing, Hudson, Bridge-ette and Zee. The schools and classes that provided the winning names received award certificates. Onlookers can spot the young falcons on the project’s FalconCam as their parents feed and care for them throughout the coming weeks. In a few weeks, the falcons are expected to learn how to hunt and survive on their own before fledging from the nest box. The Tappan Zee peregrine falcons have visited the bridge’s man-made nest box annually for decades. Similar nest boxes have steadily helped grow the state’s falcon population. Please note: the FalconCam provides an unfiltered window on the day-to-day lives of these fascinating birds of prey. At any given moment, you may see the adult falcons eating, feeding their young, defending their nest and more. These are wild birds and their behaviors reflect what really happens in nature. Some of their actions may be unpleasant to watch and it is possible that some of the fledglings may not survive into adulthood.